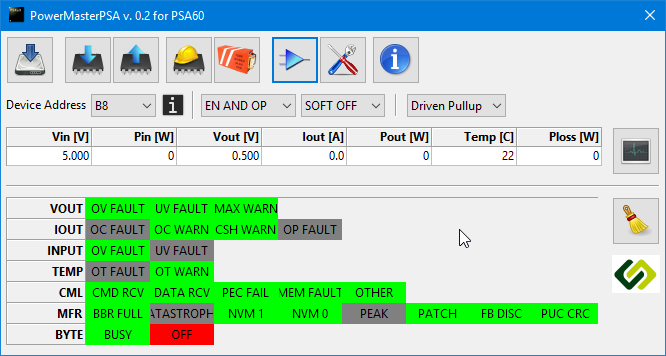 The PSA Power Master Graphical User Interface (GUI) is a software user interface that can be used with any of the PSA main stamps that incorporate the PMBus protocol. It provides power engineers with a simple and functionally powerful user interface that delivers control flexibility over their digitally-controlled power stamp products. The PSA Power Master is compatible with Windows operating systems and enables the configuration of PSA-compliant products and solutions through a USB to PMBus dongle adapter. 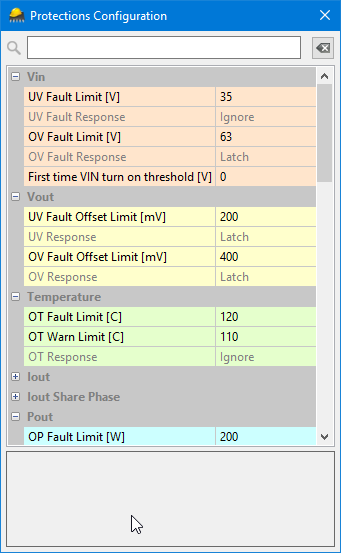 Simple telemetry can be easily observed; basic ON/OFF and sequencing commands can be issued. Detailed telemetry is also accessible through a dedicated button in the GUI. Configuration files can be uploaded and downloaded from the main unit as per the PSA-member’s user guidelines. Output voltage configuration covers set-point definition, saturation and offset functions. Advanced controls allows the user to configure and adjust protection thresholds and warnings. For further information related to the PSA Power Master GUI or for samples and demonstrations, please contact your PSA member representative or contact us via this form.